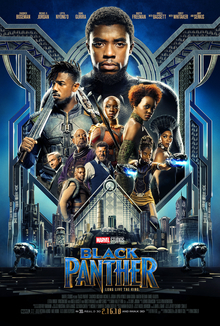 In much the same way that Patty Jenkins’ Wonder Woman overcame its in-built generic conventional weaknesses by summoning a highly of-the-moment thematic thrust of feminine agency and muscular empathy, Ryan Coogler’s Black Panther surmounts the in-born challenges facing a Marvel Cinematic Universe action-adventure blockbuster to become an absolutely vital representational and artistic assertion of pan-African pride and black power (to summon a term that gives online white conservatives, who were suspiciously eager to pre-empt the film’s nascent impact, the nervous shakes). The triumph of Black Panther is that it’s also an exciting action-adventure movie, a visually and politically detailed and compelling demonstration of onscreen world-building, and above all a nuanced and conflicted exploration of black experience, black unity, and the spirited debate about the best path of correction for the uniquely terrible legacy of colonialism, slavery, and oppression faced by people of African descent, from the centre of their (of all of our) continent of origin to the poverty-stricken housing projects of America. This first Black Panther solo film follows the character’s MCU introduction in Captain America: Civil War, in which the young Wakandan prince T’Challa (Chadwick Boseman, in a performance of laudable possession and nuanced interiority) was drawn into the larger conflict in and around the fracturing Avengers after the murder of his father, King T’Chaka (John Kani), by a terrorist bomb at the UN in Vienna. Black Panther picks up shortly after Civil War‘s events, as T’Challa returns to his home nation to assume the throne and the attendant role of Wakanda’s titular black-clad superheroic protector. After retrieving his former (and future?) flame and Wakandan secret agent Nakia (Lupita Nyong’o) from an undercover mission in Nigeria, the prodigal T’Challa is greeted by his grieving mother Ramonda (Angela Bassett, regal and spectacular but given little of consequence to do) and his sister Shuri (the luminous, scene-stealing Letitia Wright), a brilliant scientist at the forefront of Wakanda’s highly-advanced technology. Wakanda is a magnificently-realized vision of Afrofuturism, a fantastical critique of the effects of colonialism on African social development, and a utopian extrapolation of the richness of pan-African culture. Struck by a meteor long ago containing a huge supply of vibranium, an alien metal alloy that is the strongest substance on Earth (Captain America’s iconic shield is made out of it, as of course is the Black Panther suit), Wakanda emerged united following a period of inter-tribal warfare under the leadership of the first King and Black Panther, who gains superhuman physical abilities through the ingestion of the glowing purple heart-shaped herb. Choosing to remain hidden and isolated in the centre of Africa under a Third-World disguise, Wakanda developed a complex political, social and cultural profile outside of the malign influence of European colonialism that warped the rest of the continent. Developing the most advanced technology on the planet with the use of its vibranium, Wakanda becomes a fantasy fulfillment of African potential, like a Congo that safeguarded its lucrative resources (rubber and coltan, most notably) and utilized them for its own development and advancement, rather than being strip-mined for resource-exploitation purposes by Western state powers and capitalist conglomerates (to say nothing of the related genocidal deprivations, let alone centuries of the destructive slave trade on the continent). The unique utopian vision of Wakanda’s capital city – spindly skyscrapers with thatched-hut verandahs, richly-patterned neo-modern adobe-type houses, bustling market streets, and the twin towers of the royal palace, with its baked-mud-coloured skin studded with toron-like protrusions in imitation of the Great Mosque of Djenné in Mali – greets T’Challa as he returns (Hannah Beachler is the talented production designer), as does the cultural ritual that defines Wakandan royal succession. 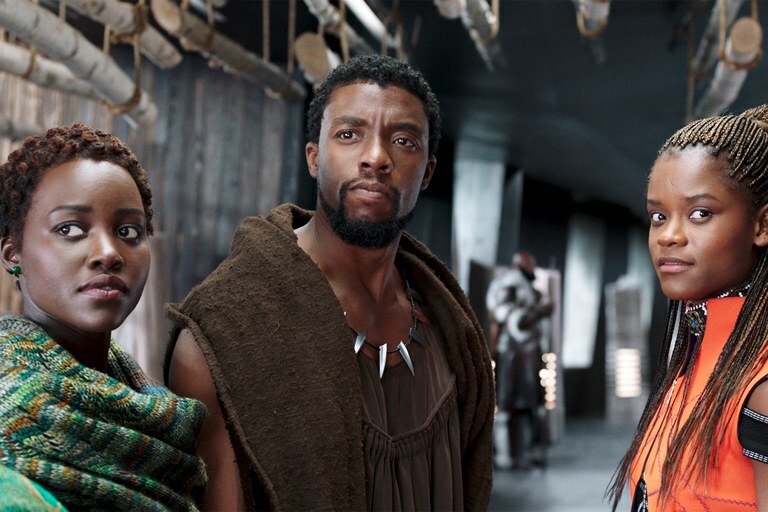 On a precipitous waterfall pool (inspired by the spectacular Victoria Falls) before the eyes and rhythmic chants of Wakanda’s monochromatically-dressed tribal leaders (if costume designer Ruth E. Carter doesn’t get an Oscar for her work here, the award has no meaning), T’Challa is stripped of his Black Panther powers and faces challenges to his presumed kingship. After triumphing over M’Baku (Winston Duke, hugely charismatic in a minor role), the head of the semi-exiled mountain tribe the Jabari, T’Challa becomes King and must begin grappling with Wakanda’s role in a changing world. Initially, that grappling takes the form of some James Bond spy-movie sequences, first as T’Challa receives new gadgets from his Q-esque sister Shuri, then as he is joined by Nakia and Okoye (the wonderful Danai Gurira), the mega-badass general of the elite royal-guard the Dora Milaje and prolific bogarter of the film’s most kickass action beats, in a secret gambling club in South Korea to bust up a clandestine deal for a stolen vibranium artifact. The thief and seller is the despised miner, smuggler, and arms dealer Ulysses Klaue (Andy Serkis), who stole a vibranium shipment at the Wakandan border years before and earned the emnity of Border Tribe leader W’Kabi (Daniel Kaluuya), while the buyer is American CIA agent Everett K. Ross (Martin Freeman), who is injured in the struggles with Klaue and his cronies and becomes an unlikely ally of T’Challa and those around him when he is brought back to Wakanda to be healed (it’s a testament to the film that its only significant white roles, both seeded in past MCU releases, are played by actors as fine as Serkis and Freeman, who get to resurrect their too-brief chemistry from the first Hobbit movie in this stretch of the movie). A lesser film would have kept the more traditionally-nasty white criminal Klaue (played with gleeful abandon by Serkis and given subtle notes of African-American cultural appropriation by screenwriters Coogler and Joe Robert Cole) as its prime antagonist, but Black Panther has something more ambitious and difficult in mind as regards its villain. Klaue turns out to be little more than a mechanism for T’Challa’s true foil to get to him and to Wakanda. This is Erik Stevens, a.k.a. Killmonger (the impressive Michael B. Jordan, who starred in Coogler’s Rocky franchise redeemer, Creed), displaced and forgotten son of T’Chaka’s brother N’Jobu (Sterling K. Brown), who had the boy when he was undercover in Oakland, California, before betraying his country, king, and brother, who then killed him for the treason. Left rootless and angry like so many young African-American males, Killmonger gained the skills of a killer and infiltrator with U.S. military black ops, and seeks to reclaim his birthright and wrest Wakanda from its new king before turning the hidden nation’s weaponry against those who oppressed black people for centuries. T’Challa must wrestle not only with the threat to his power and to Wakanda’s traditions that Killmonger represents, but also with the disillusionment and doubt that comes with the revelation of his beknighted father’s fratricide. T’Chaka fails to live up to the high ideals that he inculcated into his son, but his actions also break apart his own family in the way that the slave trade and colonial genocides did to innumerable African families, with similar generational blowback. More deeply, however, T’Challa and the movie around him wrestles impressively with the agonizing dichotomy represented by the not-completely-opposed views of T’Challa and Killmonger as regards Wakanda’s ideal role in the wider world and in correcting the injustices experienced over centuries by the African diaspora (which isolationist Wakanda has yet to attempt to ameliorate or reverse in any meaningful way). Radicalized by his experiences in the American ghetto and as a clandestine agent of American empire around the world, Killmonger intends to foment revolution against the established, white-dominated capitalist order around the world, using the American model of military-technological hegemony to build a globe-spanning Wakandan empire that will redress the wrongs done to people of African descent by putting them in charge via forceful overthrow. The oppressed, in this vision, would become the oppressors, an inversion that Killmonger expresses in other terms in his first scene, confronting a British museum curator about the colonialist theft of African artifacts on display before stealing them back (a more comic inversion of this historical dynamic comes later, when Shuri chides Ross with the epithet “colonizer” when he startles her in her lab). T’Challa, meanwhile, does not wholly disagree with Killmonger’s view of injustice, but balks at his cousin’s schemes of worldwide righteous revolution to solve it and eventually works with his cadre of allies to halt them (this leads to the moment, shockingly incongruous in this thoroughly progressive film when taken out of context, in which we are asked to root for a CIA agent trying to shoot down transports full of weapons destined for use in a global anti-capitalist revolution). The duality of perspective that divides these men is beautifully depicted in heart-shaped-herb-prompted ritual vision quests that they both undertake. T’Challa meets his father and other kingly ancestors in a gorgeous twilight savannah dreamscape with a ravishing violet-tinged sky to grapple with the difficulty of being both a good man and a just ruler, while Erik speaks with his dead father in the living room of their Oakland project, the same violet sky visible outside the window above the concrete-bound ghetto. Both of these young men have lost their fathers, like too many African-Americans males, but this loss has galvanized them in different ways: T’Challa has allowed his father’s passing (not to mention the experience of internal outcasts the Jabari, who prove to be vital allies in the final conflict) to open him up to questioning Wakanda’s traditions and its role in the world, while Erik, denied genuine connection to not only his father but to his fatherland in a mirror of the post-slave-trade African-American experience, transmutes the pain into a resentful and extreme (but hardly unreasonable) projection of his hurt onto the global institutions that he sees oppressing him (and, to a less important extent, his people, but a smartly elided element to Killmonger’s character is how his own disavowed personal agony always comes well ahead of any wider political grievances). These dualities reflect a panoply of black experience, of not only power-striving men but self-determining women (who surround T’Challa and often make more of an impression than he does), from the unbridgeable rift between America and Africa carved out by the horrors of the slave trade (which are referenced with stunning poetic power by Killmonger’s remarkable final line) to the ideological split as regards civil rights political action represented by Martin Luther King, Jr. and Malcolm X (or, alternately, Nelson Mandela as a radical young activist and as a distinguished elder statesman). Film Crit Hulk addresses these dualities and how their implications are drawn out far better than I (or perhaps anyone else) could in his recent tremendous essay on Black Panther; be sure to check it out. But Black Panther concludes with T’Challa internalizing the lessons of his defeated foe and choosing a path of active, productive, peaceful engagement with the rest of the world (and especially with the enclaves of the African diaspora, in Oakland and beyond) for Wakanda. This hard-won choice of employing Wakanda’s advantages to advocate humanitarianism and social progress is a corollary of neoliberal democratic capitalist ideology, of course, and Killmonger would no doubt find it an insufficient half-measure (as would Malcolm X, in all likelihood). But Black Panther is firmly doubtful that the sort of armed revolutionary seizure of power favoured by its nuanced villain (not to mention by the black nationalist organization that shares its name and which the superhero pre-dates) would represent any material improvement for people of African descent, or anyone else for that matter. But Ryan Coogler’s Black Panther feels revolutionary in other ways, which are no less powerful for their aesthetic focus. This is a film overflowing with love and pride for African culture, with many distinct touchstones from across the continent distilled into a pan-cultural celebration of vibrancy and endurance of traditions and families in spite of a history of being severed from those vital roots. The connective threads of that culture may have been cut long ago, but this film represents a spectacular attempt to stitch them back together (an effort clearly audible in its hybridized score, with composer Ludwig Göransson mixing orchestral elements with indigenous African music and American hip-hop curations from rap star Kendrick Lamar). It represents black people, male but especially female, as active personalities and purposeful agents in their own struggles for advancement and self-definition, itself a rarity in Hollywood history only now being slowly addressed and corrected, and whose importance to the black public this white critic can merely conjecture at. But it recognizes also the cleavages in black experience and dramatizes them in a compelling and penetrating fashion by embedding them in the core narrative and thematic conflict of the film. In a time of cultural reaction and political revanchism in which the government of the most powerful nation on earth has been co-opted by cynical, bigoted proponents of racial animus, Black Panther is a muscular and potent blockbuster that confidently and firmly claims a position of great strength for African-derived peoples without sacrificing a thoughtful, nuanced, and ultimately hopeful vision of the complexities of their society, culture, and civilization(s). Wakanda may be no more real than, say, Gotham City, but its cultural utility and impact, as expressed through this superb mass-market movie, could be very real indeed.